Do you trust your tap water? 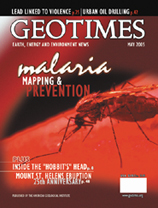 The history of malaria and its parasitic relationship between people and mosquitoes is long, but modern geospatial mapping tools are helping to prevent the diseases spread. Although phased out of U.S. paints and gasoline, lead remains in potentially dangerous concentrations in soils, posing risks to children in inner-city areas. diseases are still a rampant threat. New technology may be the key to finding arsenic-free groundwater for the people of Bangladesh and other areas plagued with the natural contaminant. Students are busting out the creativity and the science know-how to create their own Mars rovers. Although for most of us, the December tsunami in the Indian Ocean is now a distant event, it still continues to push researchers and policy-makers to examine the risks that natural hazards pose around the world. As Congress debates how to regulate air pollutants, recent rules for controlling mercury have come under harsh criticism. The metal topping the magnificent Washington Monument is only a few bucks worth of aluminum. Mount St. Helens volcano in Washington blows its top. 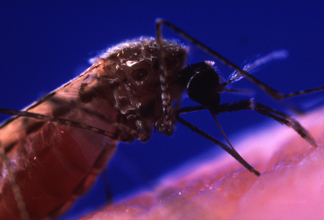 Four species of malaria can infect people, causing intense fevers and chills, among other symptoms. Scientists are using advanced models and maps of the diseases transmission to help prevent the spread of malaria, which kills 1 to 2 million people each year, with more than 90 percent of these deaths occurring in sub-Saharan Africa. Read the story on page 18. Photo is courtesy of WHO/TDR/Stammers.